Example-1 :- Convert 40° 20′ into radian measure. We know that 180° = π radian. Example-2 :- Convert 6 radians into degree measure. We know that π radian = 180°. = 343° + 38' + 10.9"
6 radians = 343° 38' 11" approximately. Example-4 :- The minute hand of a watch is 1.5 cm long. How far does its tip move in 40 minutes? (Use π = 3.14). In 60 minutes, the minute hand of a watch completes one revolution. Therefore,in 40 minutes, the minute hand turns through 2/3 of a revolution. Example-5 :- If the arcs of the same lengths in two circles subtend angles 65°and 110° at the centre, find the ratio of their radii. Let l be the length of each of the arc. 13π/36 x r₁  = 22π/36 x r₂ i.e. 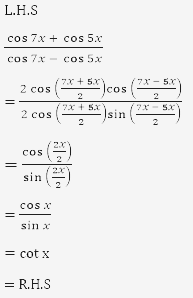 Example-6 :- If cos x = –3/5 , x lies in the third quadrant, find the values of other five trigonometric functions. Example-7 :- If cot x = –5/12, x lies in second quadrant, find the values of other five trigonometric functions. Example-8 :- Find the value of sin 31π/3. We know that values of sin x repeats after an interval of 2π. 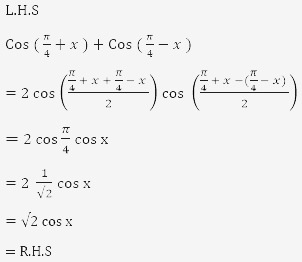 Example-9 :- Find the value of cos (–1710°). We know that values of cos x repeats after an interval of 2π or 360°. Example-11 :- Find the value of sin 15°. Example-12 :- Find the value of tan 13π/12. We know that 3x = 2x + x. Therefore, principal solutions are π/3 and 2π/3. Therefore, principal solutions are 5π/6 and 11π/6. x = nπ + (-1)ⁿ 4π/6, where  n ∈ Z.
x = 2nπ ± π/3, where  n ∈ Z.
Example-22 :- Solve tan 2x = -cot(x + π/3). x = nπ + 5π/6 where  n ∈ Z.
Example-23 :- Solve sin 2x – sin 4x + sin 6x = 0. 4x = nπ or 2x = 2nπ ± π/3, where  n ∈ Z.
x = nπ/4 or x = nπ ± π/6, where  n ∈ Z. But, sin x = 2 is not possible. x = nπ + (-1)ⁿ 7π/6, where  n ∈ Z. Copyright © 2015-18 by a1classes. All Rights Reserved.